The complicated plan hatched by Isoroku Yamamoto’s Combined Fleet staff for Operation MI, the invasion of Midway, included nearly every operational warship in the Imperial Japanese Navy. While the bulk of the fleet’s striking power would be directed at Midway, a simultaneous effort (Operation AL) with smaller forces would attack the Aleutian Islands south-west of Alaska and occupy two of them. Floating between the two forces would be Vice Admiral Shiro Takasu’s mis-named Aleutians Screening Force, which actually fell under Yamamoto’s personal command and not that of Vice Admiral Moshiro Hosogaya commanding the surface forces in the Aleutians operation. Takasu’s force would remain between the two fleets, able to steam to support either one of them as the situation dictated. At least that was the theory; they would be a minimum of 24 hours away from either fleet at maximum speed (something they were unlikely to maintain for that long). At the core of Takasu’s force would be the four elderly dreadnoughts of the 2nd Battleship Division. Fuso and Yamashiro, laid down in 1912 and 1913 respectively, were the first battleships built entirely with Japanese weapons, machinery and materials. They commissioned in 1915 and 1917, but saw no action in the First World War. As built, they were large and powerful ships, an enormous leap forward in fighting power for the Imperial Japanese Navy. They displaced 36,000 tons, compared to 22,000 tons for the previous Japanese battleships of the Kawachi class, and carried a dozen 14-inch guns in six twin turrets, all along the centerline, compared to the twelve 12-inch pieces of the older ships arrayed in a less-efficient “hexagonal” arrangement. 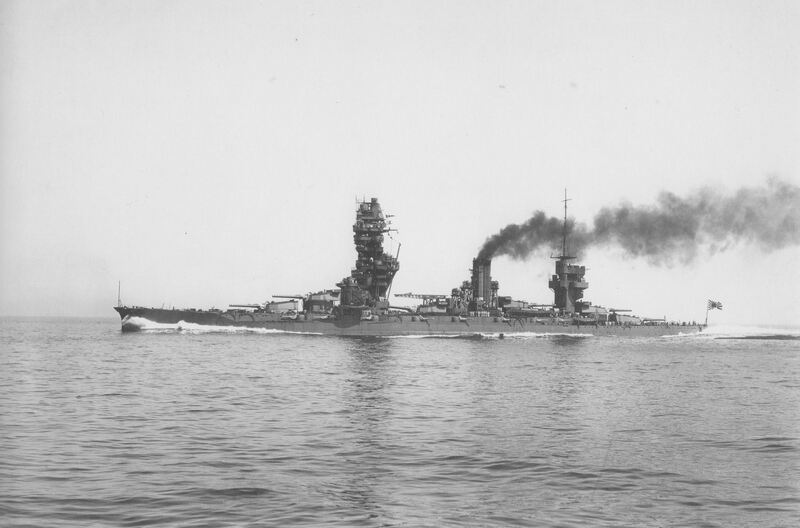 Though called the world’s most powerful battleships when launched, that edge in fighting power quickly disappeared as many navies – including Japan’s – built even larger ships with bigger guns. Yuzuru Hiraga, the Navy’s chief engineering director, drafted a plan to replace the six 14-inch turrets of Fuso and her sister with four or five twin turrets bearing 16-inch guns, arguing that these would increase the ship’s weight only slightly and could be accommodated by the wide hull. The Washington naval agreements scuttled that plan, which probably would have died for budgetary reasons anyway. 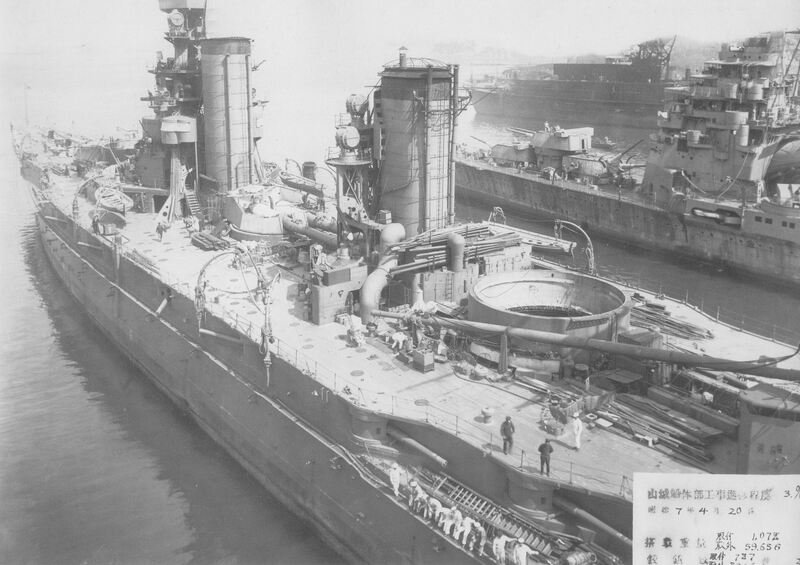 Yamashiro under reconstruction, Yokosuka Navy Yard, 1930. Both ships underwent reconstruction between 1930 and 1935. Their boilers and turbines were removed, along with their torpedo tubes, and they received a completely new set of oil-burning machinery that produced 75,000 horsepower compared to 40,000 for the original, coal-and-oil mixed firing suite. That raised their speed from 23 knots to 24.75 knots, and reduced the smokestacks from two to one. Other changes included large anti-torpedo bulges and much thicker armor on their decks and main armament barbettes as well as over their machinery spaces and magazines. The main armament could now be fired at a much higher angle, greatly extending its range. The forward mast and bridge were replaced by a massive, and fairly ugly, “pagoda tower” and the ships added a seaplane and catapult. They acquired dozens of new 25mm light anti-aircraft guns, an almost-useless weapon but an improvement over the small number of 13.2mm machine guns they replaced. Takasu’s remaining battleships, Ise and Hyuga, were laid down in 1915 and commissioned in 1917. They followed an improved version of the Fuso design, with their turrets better distributed and a new, more effective secondary gun. They entered dockyard hands for reconstruction along the same lines as their near-sisters in 1934; their superior armament layout afford more space for new machinery, and they made 81,000 horsepower in their new configuration which was good for 25.3 knots. The reconstructed Fuso on speed trials, May 1933. All four ships participated in the Pearl Harbor sortie, trailing along well behind First Air Fleet’s six carriers. They sortied in February and March against false alarms of American carrier raids, and in April as part of the futile effort to intercept the carriers that had launched the Doolittle Raid against Japan. Hyuga’s Number 5 turret exploded on 5 May 1942 during a gunnery training exercise with the other old battleships. Fifty-one sailors died and the aft magazines had to be flooded to save the ship. Shipyard workers at Kure removed the damaged guns and turret and the dead, and simply plated over the barbette with a circular piece of steel armor. Three triple 25mm anti-aircraft guns were fitted in the open space thus created, and Hyuga sailed on schedule with the rest of Takasu’s ships. The Aleutians Screening Force also included the “torpedo cruisers” Oi and Kitakami as well as a dozen modern destroyers. Though Yamamoto summoned the Fourth Carrier Division from the Aleutians operation, he didn’t call for Takasu’s battleships, and they returned to Yokosuka on 14 June, the same day that the rest of the Combined Fleet entered Hashirajima Bay near Kure. Takasu’s assigned role in the paired operations represents a foolishness bordering on insanity. After the war Japanese officers would coin the term senshoubyou, or “victory disease,” to attribute such moves to arrogance and over-confidence brought on by their many early victories – a form of humblebrag allowing them to work in references to their successes while admitting to their failures (“We lost because we were just too darned good.”). But the Imperial Navy’s penchant for hyper-complicated operations pre-dates the outbreak of war. Yamamoto wanted to attack Midway, he wanted to bring the old battleships along, and neither he nor his staff gave much thought to exactly what that might mean. Fortunately for Takasu and his crews, they encountered no American air or surface forces during their jaunt into the North Pacific. While the Imperial Japanese Navy’s hard and realistic training produced excellent naval aviators and exceptional destroyer and cruiser crews, particularly in terms of gunnery, the battleships told a different story. Gunnery training emphasized extreme-range firing, when any actual combat would likely take place at night at much closer ranges. The most promising and ambitious junior officers avoided battleship duty, wrangling assignments on the smaller warships more likely to see combat. Performance, in the few instances where Japanese battleships did use their guns, was abysmal: in March 1942 two Japanese battleships fired 297 14-inch rounds at the U.S. destroyer Edsall, claiming a single hit. They shot just as badly in their handful of other surface actions. The Japanese would be no match for American battleship sailors, by June 1942 a highly-drilled force that considered itself elite. Still worse, the Combined Fleet plan placed hundreds of miles of open water between Takasu’s four battleships and the three battleships of the Main Body. Had the Japanese met William Pye’s seven American battleships in a dreadnought clash on the open sea, the Japanese would have done so with only half of their available battle line. Japanese anti-aircraft doctrine at the time essentially left every ship to fend for itself. With no air search radar on any of his ships (Hyuga had tested surface search radar in the week before the sortie, but it was removed just before she sailed), Takasu would be dependent on spotters aboard his destroyer screen for whatever early warning could be provided. Had the American carriers found the Japanese battleships, it would have been a very bad day for the Emperor’s fleet. Midway Deluxe Edition includes Takasu’s task force; since Yamamoto could have summoned them at any moment they’re not an optional force but an integral part of the Midway scenarios (the Japanese player can choose to leave them off the map, which may be a good idea considering the problems described above). They also get to fight the American battleships in a few battle scenarios, because it could have happened. Bet on the stars and stripes when that happens. 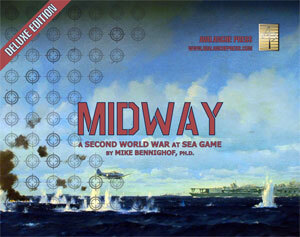 Mike Bennighof is president of Avalanche Press and holds a doctorate in history from Emory University. A Fulbright Scholar and award-winning journalist, he has published over 100 books, games and articles on historical subjects. He lives in Birmingham, Alabama with his wife, three children and his dog, Leopold. Leopold likes catching lightning bugs.